We all love to capture memories using our camera in form of images so you can keep it safe to have a look back sometimes later or post on the social networks like Facebook and Twitter or WhatsApp. What if you lose them? What do you do then? While you can always recover it back from the Recycle Bin, but if you have permanently deleted it either using Shift+Delete or from the Recycle Bin, it will be impossible to bring it back. However, you still have a chance of using a photo recovery software – Recoverit – which can restore deleted photos from your Windows PC. 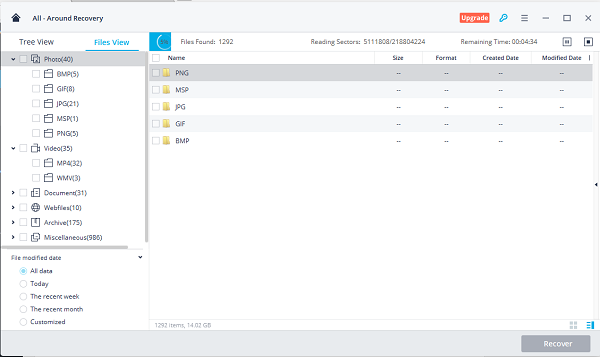 It’s a professional data recovery software (8 recovery modes) which performs photo recovery and lets you recover 100MB of data in its free version. You can always choose the paid version for more. Once you have downloaded this software, install it and then launch it. You get 8 recovery modes. 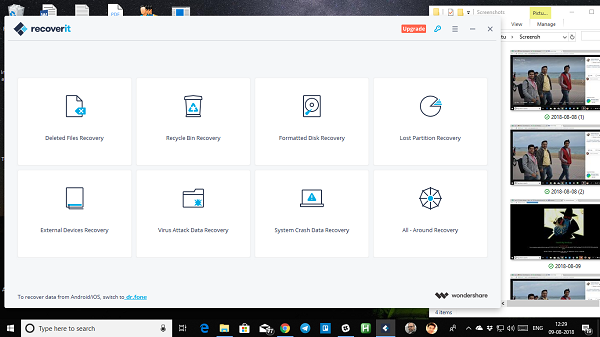 It includes Deleted File recovery, Recycle bin recovery, Formatted Disk Recovery, Lost Partition recovery, external devices recovery, virus attack data recovery, system crash data recovery and All around recovery. Step 1: Depending on the scenario, you need to select one of them. In my case, I am trying to recover Deleted File recovery to recover images from a folder which I usually use to save screenshots. Step 2: The next step is to select the drive where your photos where placed. Sadly there is no option to select a folder which means it might take a lot of time. Click on the Start button. Step 3: This will start the recovery process. Depending on how many files it had to scan, you should get the results in a few minutes to maybe an hour. Step 4: Post recovery, you can change few options to find your file faster. You can scan photos which were deleted recent week, recent month, today and so on. You can also enter a file name or set a path where the software can scan for the deleted file. You can specify the file type category you want to recover. You get a tree-view on the left-hand side, which lists down all the folders with the number of files it can recover for you. Navigate, and you will see all the files that can be recovered. If you are using the free version, make sure to know that you can recover only 100 MB of data. Step 4: Make sure to save the file in a completely different location, preferably on a USB drive. If you choose the same drive, you will get a warning. Note: Since this is the free version, every time you try to recover a file it will calculate it against your 100 MB quota. You will get a pop-up screen for that, so choose to evaluate. You will get to see how much MB is left, and choose accordingly. Here is one catch though, the 100 MB limit is per session only. If you start a new search, it resets the value back to 100. That said, here is one thing you should know about how storage is managed by Windows PC. 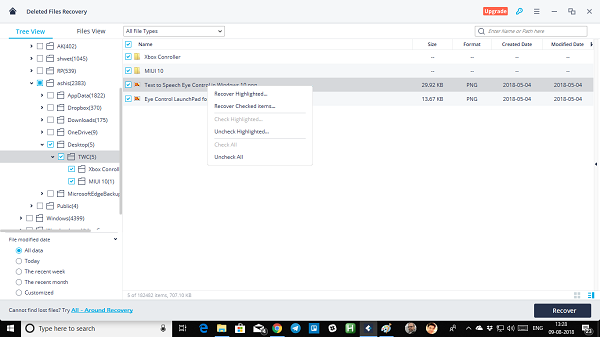 When a file is deleted from a PC, it becomes invisible even though its there. Whenever some new files become available, the system overwrites that part of storage with this new file. Recover almost all the files: You can recover lost or deleted files, photos, audio, music, emails from any storage device. The only rule of thumb is that you had not overwritten that space with something else. Many a time even when you recover a file, it doesn’t work because part of the data is corrupted. Multiple Recovery Options: You can recover data from the Recycle Bin, hard drive, memory card, flash drive, digital camera, and camcorders. In case you want to recover from the phone, you need to connect it as a USB storage using external drive mode. Useful in worst-case scenarios: It also offers to recover data in a special loss scenario like sudden deletion, formatting, lost partition, virus attack, system crash under different situations. This can come in very handy if the data matters to you a lot. 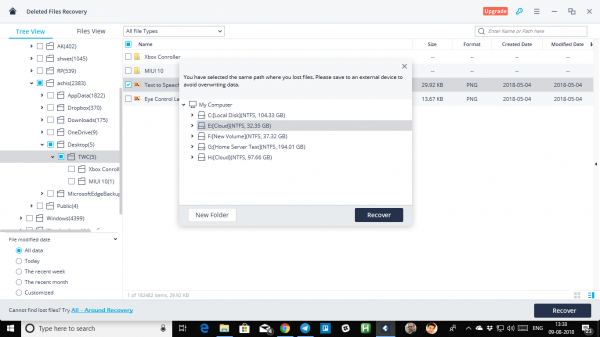 In case you have a hard disk from another drive, you can connect to the PC where this software is installed, and use the System Crash Data recovery option. Tree View + Files View: It offers two modes here. The tree view is the usual directory browser which reveals file name, however, if you want to have a better look at files, you can choose Files View. One of the biggest advantage of files view is that it sorts out files based on types. You can view videos, images, setup files etc at one place which makes it easier to recover. Overall the software works, and you can try the free version first before buying. If you can recover files which you need, recommend you to purchase the pro version. Recoverit Free is a free and professional data recovery software, which provides eight recovery modes for users. But the free version allows users to recover 100MB of data for free at most. To recover more, it is necessary to upgrade. 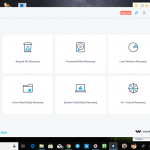 You can download Recoverit Free Data Recovery software from wondershare.com.